A couple of years ago, we did an awesome collaboration with 826LA, the creative writing, non-profit for kids. 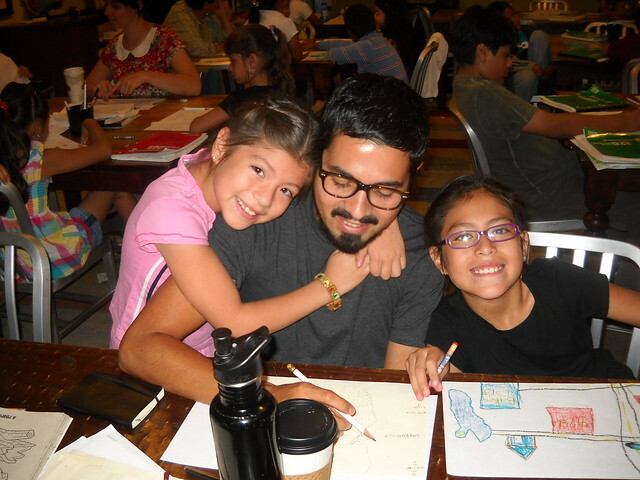 We paired Poketo artists to illustrate stories written by the students at 826LA. The kids wrote amazing, creative stories and the artists came up with amazing artwork to illustrate each of the stories that eventually became Poketo wallets. Part of what makes each of the eight 826 National chapters across the country so memorable is the quirky themed storefront attached to the writing/tutoring center. For example, Brooklyn’s storefront is the “Superhero Supply Co.”, San Francisco has “The Pirate Store”, Michigan has the “Robot Supply & Repair Shop”, and Los Angeles is “The Time Travel Mart”. 826LA’s Time Travel Mart is a quirky store that sells Evil Robot Memory Erasers, mustache disguises, and Viking Deodorant among many other fun time-inappropriate things. You can only imagine what the other storefronts carry. For our latest Fall Collection, we shot at 826LA and caught up with program manager, Marisa Urrutia Gedney. Read below, to find out all about 826LA! What’s 826LA in a nutshell? 826LA is a non-profit organization dedicated to supporting students ages 6 to 18 with their creative and expository writing skills, and to helping teachers inspire their students to write. We believe that great leaps in learning can happen with one-on-one attention, and that strong writing skills are fundamental to future success. Our programs are challenging and enjoyable, and ultimately strengthen each student’s power to express ideas effectively, creatively, confidently, and in his or her individual voice. Photo by Meiko Takechi Arquillos. What’s the most fulfilling part of an 826LA day? Seeing our students beaming with a sense of accomplishment–whether its because they finished their homework, were just published, or made some breakthrough in their learning–is always a joy and serves as constant validation for the work that we do. Why did you choose Echo Park? 826LA was established in Venice in 2005 where it still operates and provides our free services. Due to a demand from supporters on the east side of town, we opened our doors in Echo Park in January 2008. Echo Park was an easy choice since the 90026 area code is home to over 20,000 students. There are about six schools within walking distance and the demand for our free programs continues to grow. For the 826 model to work, there needs to be a strong volunteer base nearby, and Echo Park has a community with all the elements required to help grow our programs. What your favorite thing about the neighborhood? 826LA! 826LA is able to bring together all ages of kids, families, college students, retired folks, and the range of everyone else who lives in Echo Park to do great things. Behind the robot and the caveman, a student can be writing her first poem with the help of a volunteer. We might be hosting a parent advisory board meeting with a Red Cross representative sharing first aid preparation to our parents. A group of students could be performing in their first ever rock opera, while volunteers serve as the musical background. What is the most satisfying thing about being part of the Echo Park Community? The most satisfying thing about being a part of the Echo Park Community is just that; being a part of the community. Many first time visitors to the Echo Park Time Travel Mart do not know about 826LA, most of them came in because they thought they were walking into a convenience store. After a customer has browsed around long enough to look entertained and thoroughly confused we let them in on the joke and tell them that the store is a front for a non-profit organization called 826LA. At the 826LA storefront wearing a Bears on Bike Eco-fleece. We give the back story and let them peek into the writing lab. We always show them samples of student publications (which almost everyone who comes here buys), but the look on their face when they see what we are doing here always reaffirms our mission. A good portion of our volunteers come to us in just this way. Find out more about 826LA or become a volunteer! More at 826la.org.